Maca powder, which has so many notable health benefits, has a caramel-y flavor that blends well into smoothies of all sorts. Here, it teams well with the strawberry, banana, and vanilla flavors. If you’re new to maca, use the lesser quantity; if you’ve been using it, allow for 2 teaspoons per serving. This makes about two 12-ounce servings. Photos by Ollzha. Maca powder, which has so many notable health benefits, has a caramel-y flavor that blends well into smoothies of all sorts. Here, it teams well with the strawberry, banana, and vanilla flavors. Combine all the ingredients in a blender and process until completely smooth. Divide between two glasses. If too thick, add a bit more almond milk. Serve at once. 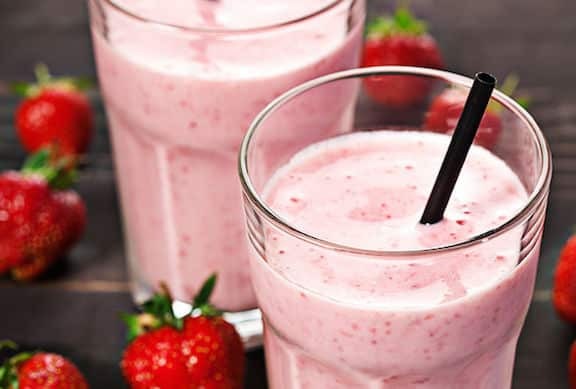 Here are more fruit smoothies. 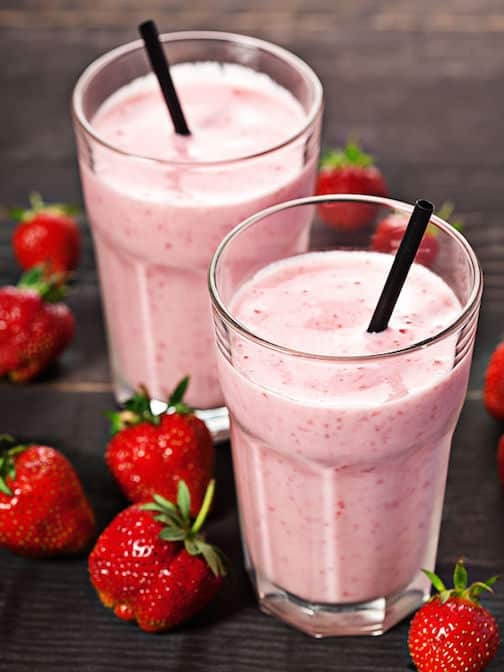 Enjoy more recipes for summer smoothies. Hello, I am maca company(MAGOMACA) employee. I hope writing this recipe and photo in my company blog. Not commercial, just information delivery! Can i use this recipe and photo? Hello, sure, go ahead and use the recipe and photo with a link back to VegKitchen.com. Thanks for asking! Alice, you can substitutean apple or pear and it will still taste great! This recipe is fabulous! Super tasty! I heard this maca powder is good and helps against miscarriage. I am wondering if it is possible to have the smoothies during pregnancy as well? I had a miscarriage at 19 weeks.